The surgeon who manages maxillofacial trauma must be familiar with techniques for the repair of injuries that involve the anterior skull base. Complex high-impact fractures may result in communication between the anterior cranial fossa and the facial or sinus structures. These types of fractures include posterior wall fractures of the frontal sinuses, fractures through the foveae ethmoidale, and fractures through the cribriform plate. These may be associated with cerebrospinal fluid (CSF) leaks, or frank herniation of intracranial structures (dura, brain) may occur. Associated orbital injuries may also be present, including possible trauma to 1 or both optic nerves. 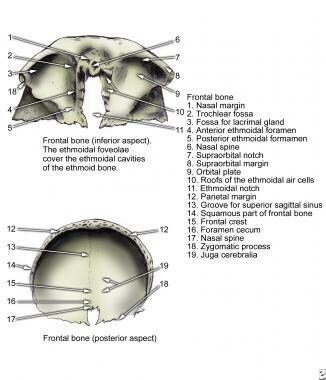 The image below depicts the frontal aspect of the skull. The technique, a logical extension of previously existing approaches, was originally developed by Raveh for skull base access to tumors that involved the paranasal sinuses and anterior fossa. It was a result of continuing the advances in craniofacial resection techniques with the osteotomies used for the repair of congenital craniofacial anomalies. This ultimately led Raveh and others to extend the frontal craniotomy flap inferiorly to include the nasal root and nasal bones, as depicted in the image below, thereby allowing direct access to the nose, sinuses, orbits, and frontal fossa with minimal, if any, retraction of the frontal lobes. A typical subcranial bone flap is shown in the image below. A typical subcranial bone flap. Adaptation of this technique to trauma progressed gradually through the transethmoidal approach to the skull base to the more extensive debridement of the frontal and ethmoid areas. This technique may be called the near-subcranial approach, ultimately to include complete disarticulation of the nasal root and nasal bones, thus becoming the complete subcranial approach. This approach allows wide exposure of the anterior fossa, cribriform plates, foveae ethmoidale, and orbits with minimal, if any, frontal lobe retraction. The subcranial approach is used to manage complex fractures of the anterior skull base that may include fractures of the floor of the anterior fossa and/or the posterior wall of the frontal sinuses. Cases of severe frontobasal trauma often include injury to the frontal lobes of the brain, which may make retraction of the frontal lobes to repair dural tears and fractures more risky to the patient. Traditionally, because reaching the fractures via a standard bifrontal craniotomy requires significant frontal lobe retraction, repair is delayed, making the ultimate repair more difficult and increasing the risk of interim meningitis. The subcranial approach allows access to these areas with limited, if any, frontal lobe retraction, minimizing the risks of earlier surgical intervention. Most fractures of the nasal root, frontal sinuses, and anterior fossa that are severe enough to benefit from this approach are the result of high-impact trauma (eg, motor vehicle accidents, industrial accidents). Altercations can produce such injuries when a tool, such as a hammer or baseball bat, is swung powerfully enough to generate a sizable impact force. Patients typically present with significant facial swelling and bruising. Often, the patient has associated injuries to one or more organ systems, and the facial plastic surgeon is generally not the first specialist involved. Severe frontobasal trauma often involves injuries to the brain, and neurosurgeons generally stabilize the patient and consult otolaryngologists later. Having the initial brain CT scan include at least a low-resolution survey of the facial bones (when feasible) is beneficial to help in treatment planning. The patient may have a markedly depressed nasal root, which may indicate a telescoped nasoethmoidal complex and/or an associated Le Fort II or III fracture with facial rotation. Assessing the tension of the medial canthal ligaments is extremely important because late development of telecanthus can create a significant and unsightly deformity if such an injury is missed. Periorbital edema and ecchymosis are common. Assessing visual function is extremely important; if the patient is awake, he or she may report decreased vision. An afferent pupillary defect (APD) must be detected if present because it may indicate an optic nerve injury. The patient may report diplopia, and evaluating the extraocular movements (EOMs) is extremely important. If any doubt exists about the EOMs, perform a forced duction test. If the patient reports rhinorrhea or if clear rhinorrhea is noted by a nurse, then the patient should be evaluated for a possible CSF leak. Anosmia similarly may be observed with severe frontobasal trauma. For the most part, most severe facial fractures are identified more on high-resolution CT scans than on clinical examination. High-impact trauma in the central facial region can lead to displacement of the nasal root with telescoping of the nasal bones posteriorly into the ethmoid sinuses, whose thin walls may collapse and accordion posteriorly. This has been called the nasoethmoidal complex (NEC) fracture or, more recently, the naso-orbital-ethmoid (NOE) fracture. 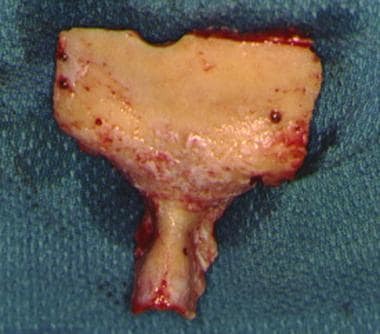 The cribriform plate and/or ethmoid roofs (foveae ethmoidale) may be fractured, leading to CSF rhinorrhea, with or without herniation of the brain (traumatic encephalocele). These fractures generally disarticulate the medial canthal ligaments, which must be carefully repaired to prevent unsightly telecanthus. Fracture of the posterior walls of the frontal sinuses similarly may lead to CSF leaks, with or without brain herniation. The subcranial approach has been shown to be quite effective for the repair of CSF rhinorrhea. Occasionally, fractures may extend into the planum sphenoidale and optic canals. In some cases, the subcranial approach involves completing existing fractures, and, in severe cases, it may merely be a matter of removing loose fragments, as depicted in the image below. Removal of a free-floating nasal root with resultant exposure of the shattered anterior fossa floor is the beginning of the subcranial approach. Removal of the frontal sinus completes the approach. A case involving fracture with complete mobility of the nasal root and nasal bones. Disarticulating the nasal segment allows access to the anterior subcranial area. This exposure allows direct access for repair and grafting of the fractures. Wide exposure of the medial orbits enables optic nerve decompression. The frontal sinuses can be easily cranialized, obliterated, or reconstructed. The subcranial approach also can be used for secondary repair of traumatic CSF leaks or traumatic encephaloceles. In these cases, the approach is the same as that used for tumor excision. Although experience in children is limited, the procedure can be considered a variant of congenital craniofacial surgery. Kellman and Goyal reviewed several cases in which the procedure was used to remove from growing children nasal dermoids with intracranial extension. [4, 2] After a follow-up of 15 years, no noticeable growth disturbance was seen in these patients as they grew. The subcranial approach involves a bone flap for access that includes the anterior inferior frontal bone, including the medial superior orbital rims and the root of the nose and the nasal bones. Relevant anatomy includes the medial orbits, attachments of the medial canthal ligaments, the relationship of the nasal bones to the upper lateral cartilages and the nasal septum, the location of the ethmoid arteries and the supraorbital and supratrochlear nerves, and the relationship between the bone flap and underlying crista galli and anterior fossa contents. Anyone using this approach should be thoroughly familiar with this anatomy. The facial skeleton serves to protect the brain; house and protect the sense organs of smell, sight, and taste; and provide a frame on which the soft tissues of the face can act to facilitate eating, facial expression, breathing, and speech. The primary bones of the face are the mandible, maxilla, frontal bone, nasal bones, and zygoma. Facial bone anatomy is complex, yet elegant, in its suitability to serve a multitude of functions. See the images below. 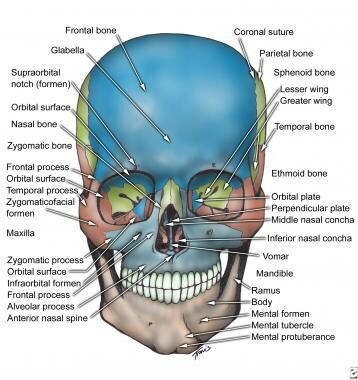 For more information about the relevant anatomy, see Facial Bone Anatomy, Skull Base Anatomy, Forehead Anatomy, Nasal Anatomy, and Orbit Anatomy. See also Facial Nerve Anatomy and Mouth Anatomy. No absolute contraindications exist that are specific to this procedure. Since repair of the anterior fossa floor can be accomplished without brain retraction, frontal lobe contusions are not a specific contraindication. Ocular injuries that may predispose to blindness (eg, retinal detachment, globe tear) are relative contraindications. In addition, general contraindications remain that are not procedure specific, such as severe brain injury with swelling and danger of herniation, hemodynamic instability, clotting abnormalities, and other medical conditions that are considered contraindications to a major surgical procedure. Jung TM, TerKonda RP, Haines SJ, Strome S, Marentette LJ. Outcome analysis of the transglabellar/subcranial approach for lesions of the anterior cranial fossa: a comparison with the classic craniotomy approach. Otolaryngol Head Neck Surg. 1997 Jun. 116(6 Pt 1):642-6. [Medline]. Goyal P, Kellman RM, Tatum SA 3rd. Transglabellar subcranial approach for the management of nasal masses with intracranial extension in pediatric patients. Arch Facial Plast Surg. 2007 Sep-Oct. 9(5):314-7. [Medline]. Fliss DM, Zucker G, Cohen JT, Gatot A. The subcranial approach for the treatment of cerebrospinal fluid rhinorrhea: a report of 10 cases. J Oral Maxillofac Surg. 2001 Oct. 59(10):1171-5. [Medline]. Kellman RM, Goyal P, Rodziewicz GS. The transglabellar subcranial approach for nasal dermoids with intracranial extension. Laryngoscope. 2004 Aug. 114(8):1368-72. [Medline]. Gil Z, Cohen JT, Spektor S, Fliss DM. The role of hair shaving in skull base surgery. Otolaryngol Head Neck Surg. 2003 Jan. 128(1):43-7. [Medline]. Mathur KK, Tatum SA, Kellman RM. Carbonated apatite and hydroxyapatite in craniofacial reconstruction. Arch Facial Plast Surg. 2003 Sep-Oct. 5(5):379-83. [Medline]. Raveh J, Laedrach K, Vuillemin T, Zingg M. Management of combined frontonaso-orbital/skull base fractures and telecanthus in 355 cases. Arch Otolaryngol Head Neck Surg. 1992 Jun. 118(6):605-14. [Medline]. Kellman RM. Use of the subcranial approach in maxillofacial trauma. Facial Plastic Surg Clinics of NA. 1998. 6:501-510. Gliklich RE, Lazor JB. The subcranial approach to trauma of the anterior cranial base: preliminary report. J Craniomaxillofac Trauma. 1995 Winter. 1(4):56-62. [Medline]. Raveh J, Vuillemin T, Sutter F. Subcranial management of 395 combined frontobasal-midface fractures. Arch Otolaryngol Head Neck Surg. 1988 Oct. 114(10):1114-22. [Medline]. Ciechomski J, Aufgang R, Villanueva L, Demarchi V. Subcranial approach in pediatric craniofacial surgery. Craniomaxillofac Trauma Reconstr. 2010 Dec. 3(4):231-6. [Medline]. [Full Text]. Zubillaga-Rodríguez I, Falguera-Uceda MI, Sánchez-Aniceto G, Montalvo-Moreno JJ, Díez-Lobato R. [Subcranial approach. Technical aspects and application in craneofacial traumatic pathology]. Neurocirugia (Astur). 2010 Dec. 21(6):467-77. [Medline]. Raveh J Laedrach K. Versatility of the subcranial approach and indications for combined procedures in extensive anterior and central skull base tumors. ESBS 2005: Skull Base Surgery: An Interdisciplinary Challenge. 7th Congress of the European Skull Base Society held in association with the 13th Congress of the German Society of Skull Base Surgery. Fulda, 18.-21.05.2005, Fulda, Germany. Dusseldorf: German Medical Science GMS Publishing House, 2009 Published online. January 27, 2009. Delfini R, Iannetti G, Belli E, Santoro A, Ciappetta P, Cantore G. Cranio-facial approaches for tumours involving the anterior half of the skull base. Acta Neurochir (Wien). 1993. 124(2-4):53-60. [Medline]. Donald PJ. Frontal sinus ablation by cranialization. Report of 21 cases. Arch Otolaryngol. 1982 Mar. 108(3):142-6. [Medline]. Janecka IP, Sekhar LN. Anterior and anterolateral craniofacial resection. 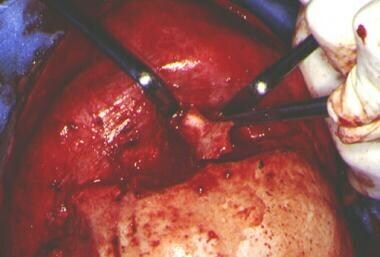 Surgery of Cranial Base Tumors. Lippincott Williams & Wilkins; 1993. 147-156. Levy RA, Edwards WT, Meyer JR, Rosenbaum AE. Facial trauma and 3-D reconstructive imaging: insufficiencies and correctives. AJNR Am J Neuroradiol. 1992 May-Jun. 13(3):885-92. [Medline]. Levy RA, Kellman RM, Rosenbaum AE. The effect of computed tomographic scan orientation on information loss in the three-dimensional reconstruction of tripod zygomatic fractures. Invest Radiol. 1991 May. 26(5):427-31. [Medline]. Levy RA, Rosenbaum AE, Kellman RM, Bailey GL, Aravapalli SR. Assessing whether the plane of section on CT affects accuracy in demonstrating facial fractures in 3-D reconstruction when using a dried skull. AJNR Am J Neuroradiol. 1991 Sep-Oct. 12(5):861-6. [Medline]. Pinsolle J, San-Galli F, Siberchicot F, Caix P, Emparanza A, Michelet FX. Modified approach for ethmoid and anterior skull base surgery. Arch Otolaryngol Head Neck Surg. 1991 Jul. 117(7):779-82. [Medline]. Raveh J, Laedrach K, Speiser M, et al. The subcranial approach for fronto-orbital and anteroposterior skull-base tumors. Arch Otolaryngol Head Neck Surg. 1993 Apr. 119(4):385-93. [Medline]. Raveh J, Redli M, Markwalder TM. Operative management of 194 cases of combined maxillofacial-frontobasal fractures: principles and surgical modifications. J Oral Maxillofac Surg. 1984 Sep. 42(9):555-64. [Medline]. Raveh J, Turk JB, Ladrach K, et al. Extended anterior subcranial approach for skull base tumors: long-term results. J Neurosurg. 1995 Jun. 82(6):1002-10. [Medline]. Roux FX, Devaux B, Nataf F, et al. [Malignant tumors of the ethmoid region. Neurosurgical techniques]. Neurochirurgie. 1997. 43(2):92-9. [Medline]. 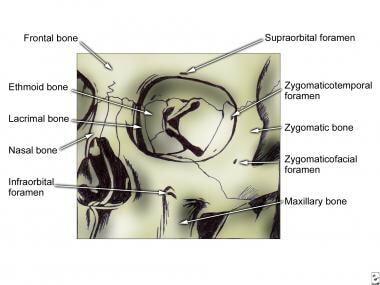 Schaller B. Subcranial approach in the surgical treatment of anterior skull base trauma. Acta Neurochir (Wien). 2005. 147:355-366. Sekhar LN, Nanda A, Sen CN, Snyderman CN, Janecka IP. The extended frontal approach to tumors of the anterior, middle, and posterior skull base. J Neurosurg. 1992 Feb. 76(2):198-206. [Medline]. Stanley RB Jr. Management of severe frontobasilar skull fractures. Otolaryngol Clin North Am. 1991 Feb. 24(1):139-50. [Medline]. Tessier P. The definitive plastic surgical treatment of the severe facial deformities of craniofacial dysostosis. Crouzon's and Apert's diseases. Plast Reconstr Surg. 1971 Nov. 48(5):419-42. [Medline]. Vanaclocha V, Saiz-Sapena N. Surgical treatment of anterior skull base tumours. Acta Neurochir (Wien). 1997. 139(9):857-68. [Medline]. The subcranial bone flap has been removed. Note the remaining portion of the distal nasal bones in situ. An example of obliteration of the frontal sinuses using calcium phosphate bone cement. The sutures seen in this figure each are attached to the contralateral medial canthal ligaments and passed behind the nasal bones. They then can be secured to the frontal bones to maintain the desired positions of the medial canthi.